Cindy looks at me with her big, brown eyes full of wonder, just a hint of a pucker on her lips to show me she’s not really sure what she’s smelling. Now her look is one of abject horror. I’ve thrown her for a loop. I can see I’ve lost her. I redirect. My eight-year old thinks for a moment. The wheels turn in that pretty little head and her eyes brighten even more. I think she’s got it. “Hay and wet dog and damp dirt and fresh mown grass and oh! … Charlie’s wet mane!! 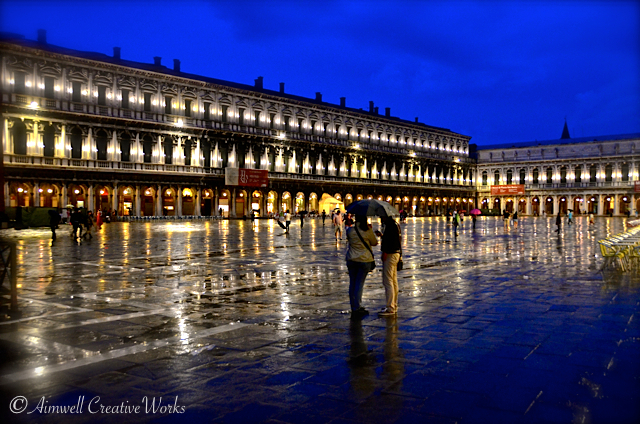 !” Cindy’s smile is as wide as this wet, ancient piazza. 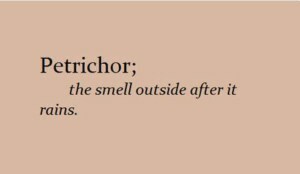 A recent memory of that old codger of a pony coming in soaking wet from the paddock has taught her about petrichor. This is a charming post Dorothy! In every way…. I never knew there was a name for that! !